Posted January 23, 2015 by trekkit & filed under Iceland, trekkit. Click to Watch Now. 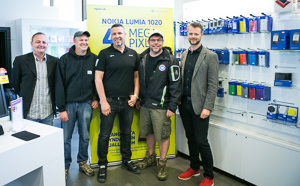 In mid June 2014, four friends departed from Halifax airport to embark on an epic journey to Iceland to film the Wonders of Iceland series for Trekkit TV. We used 9 cameras and captured 650 gigs of data while circling Iceland. It has been sitting on my hard drive patiently waiting to be transformed into a story of this marvelous adventure. After many months of other projects, other videos that needed to be cut first, and code to be written, finally the first episode is ready. And we are excited! It will be airing on Bell Aliant TV1 on Channel One on FibreOP TV on February 9, but because I got it done early and I wanted to show all of you sooner, Bell Aliant (thanks John and Csaba) got the episode out to the web ahead of time so my audience can view it early. Click here to watch Episode One on Trekkit TV. 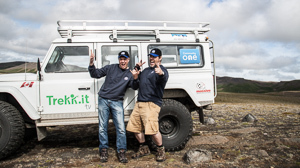 In this episode the team lands in Iceland, picks up the Land Rover we call Happy, then heads to see the Microsoft/Nokia folks in Iceland. Then we head off to a relaxing and goofy visit to the Blue Lagoon before we head off to the mid-Atlantic Rift and get a geology lesson from Dr. Dirt himself! 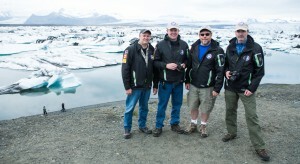 For those not familiar with our journey to Iceland take a look at our two trailers on YouTube. Also a big thanks to all those that helped get us there. Check out our sponsors and supporters. Well off to finish up Episode 2 which is slated for broadcast in early March, maybe sooner. Please send any feedback to us as we would love to hear from you.